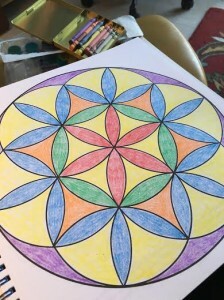 A couple of years ago I did some posts—like this one—about coloring mandalas. Could have been about coloring anything, really. A friend of mine recently confessed to me that she keeps a child’s coloring book and crayons by her bed and colors when she’s stressed or just wants to relax. And another friend is about to publish a book about coloring as a form of prayer. And then I read (in an article in yesterday’s Parade Magazine) that Susan Albers, Psy. 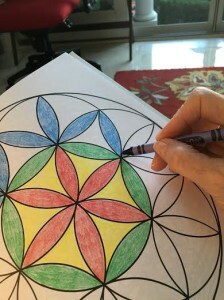 D., a Cleveland Clinic clinical psychologist and author of 50 More Ways to Soothe Yourself Without Food, recommends coloring for relaxation, specifically to reduce stress. I knew I was onto something. And then I found this article: “50 Shades of Happy: The New Joy of Coloring.” It even has some downloadable coloring pages. I think I’ll get the sheet music to Colour My World (Chicago) and play it on my kayboard…. So the next time stress drives you to eat or drink too much, or to skip your exercise routine and spend too much time watching TV, keep some coloring books and crayons or colored pencils nearby. It’s amazing how much it helps. Have a great week.